After some updates for Groestlcoin and Fuguecoin in the previous releases, the new ccMiner 0.5 comes with a significant performance improvement for Heavycoin (HVC) mining on Nvidia-based GPUs. The new version of the mining software brings up to twice the performance improvement on older cards and it can go even up to triple on GTX 750 Ti Maxwell cards, so it is good to update if you are still using the older version of the miner. The new release of ccMiner does add the option -d for selecting a particular device that you should know from using CudaMiner. You can download the official binary release for windows below and you can also compile from the source as well. The new version comes with precompiled binaries for Compute 2.0, 3.0 and 3.5 cards, so on older cards you will most likely have to run the 2.0 compiled binary and for the 700 series the Compute 3.5 should be the best option. 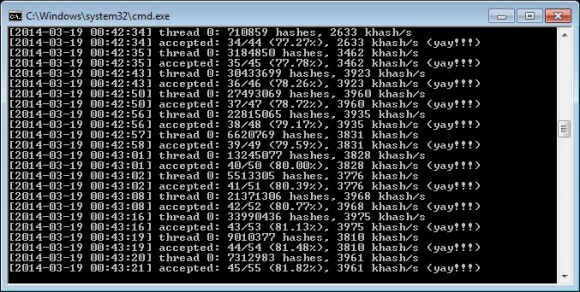 Our tests have shown that we got more than twice the performance on a GTX 780 Ti graphics card where with the latest version we are getting around 23 MHS mining HVC as you can see on the screenshot above. With that level of performance the AMD GPU miner for Heavycoin is left way back with much slower performance you can get from a high-end GPU, even though that software miner also gets performance optimizations. CCminer is a new miner for Fuguecoin and Heavycoin mining on Nvidia graphics cards by the author of the CudaMiner software and today a new version has been released. In version 0.2 there are mostly performance optimizations for mining Fuguecoin, so if you use the miner for HVC mining there may be no need to update. Fuguecoin mining was pretty much possible only in solo mining up until recently, but there is now a pool for FugueCoin available that works with the new ccminer (though the pool might need some more work). The pool does not need registration and uses your wallet address as worker, so you can be up and mining in no time if you want to try FugueCoin (FC) mining. We have tested the new miner and the pool and we got about 180 MHS from a single GTX 780 Ti video card. Below you can download the new ccminer version 0.2 for windows and you can get the source and compile from it as well. 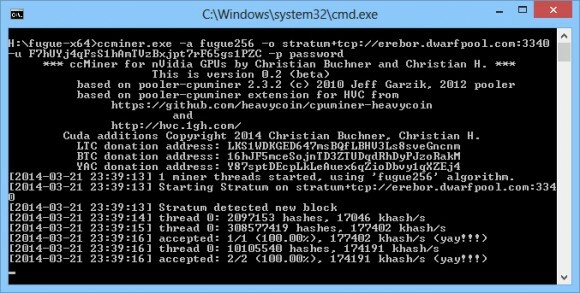 Christian Buchner, the author of the CudaMiner software for mining popular alternative crypto currencies on Nvidia-based GPUs has just released another software called CCminer that is intended to support CUDA GPU mining for Heavycoin (HVC) and Fuguecoin (FC). The GPU miner for Nvidia seems to be offering better performance than the recently released AMD GPU miner for HVC. We have compiled a x86/x64 windows binary from the source code with Compute 3.5 capability and with Visual Studio 2012 (if you are getting errors when running about missing Dll file you may need to download and install Visual C++ Redistributable for Visual Studio 2012). The performance we are getting on a GeForce GTX 750 Ti card with no overclock is about 4 MHS (4000 KHS) and on a GeForce GTX 780 Ti we get about 10.5 MHS (10500 KHS) with no overclock and raised power limiter to 106%. So if you have a few Nvidia-based GPUs you might want to try mining Heavycoin for a bit with them while the HVC exchange rate is still decent and with some AMD GPU miners getting away from HVC mining. In our experience the 64-bit version of the miner does give less shale shares (less booos) as compared to the x86 binary, though not much difference in performance in terms of hashrate between the two.